Fred Rogers isn't going to break your heart in Won't You Be My Neighbor? That was the fear surrounding a feature documentary about the mild-mannered creator of Mr. Rogers' Neighborhood, especially in this age when celebrated men are identified almost daily as abusers, harassers and predators. Sure, it's the 50th anniversary of the show, but would that be a sufficient reason for exploring the world of its creator? We couldn't take it if scandal took Mr. Rogers, but why else spend 90 minutes profiling him, if not to dig up skeletons keeping company with the cardigans in his closet? Director Morgan Neville, blessedly, has no such agenda. Won't You Be My Neighbor? offers a narrow focus on Rogers' life as a public figure, bypassing cradle-to-grave biography—Rogers died in 2003—to begin with the 1950s precursor to Neighborhood and follow his broadcasting efforts from the premiere of Neighborhood in 1968 on Pittsburgh PBS station WQED, through his initial retirement to later TV appearances including a post-9/11 special. While Rogers' widow and two sons are interview subjects, Neville generally doesn't dig into the man's personal life, beyond anecdotes about his disciplined physical fitness regimen and personal pride at maintaining the same body weight. When there are attempts to draw connections between Rogers' work and his childhood, they're accompanied by animation that imagines him as his puppet alter-ego, Daniel Striped Tiger. 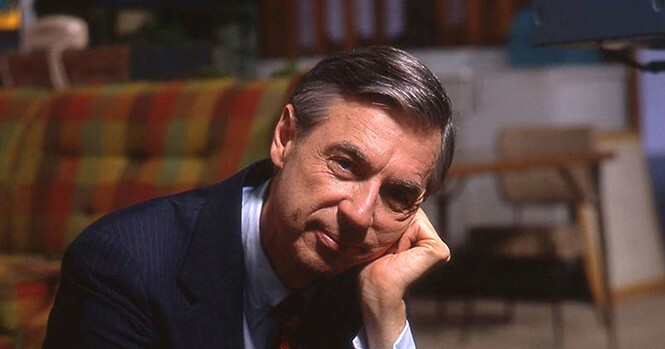 What Neville seems most interested in, however, is the legacy of Mr. Rogers' Neighborhood, and its improbable success given that one former crew member describes the show as "you consider all of the elements that make good television, and you do the exact opposite." There's a clever montage devoted to the way Rogers "used time differently," not just by taking precious air time to change his shoes, but feeding fish, peeling an apple or changing a lightbulb. And there's a recognition of the way Rogers could subtly impact the perception of his audience, as in a scene from a 1969 show in which he and the Neighborhood's resident police officer, African-American actor François Clemmons, cool their feet together in the same wading pool. Plus, we see that he spoke to children about things even modern adults have trouble understanding, since the very first episode of Neighborhood involved King Friday building a wall around his kingdom out of fear of change. Beyond all that, there's the kind of hagiography that feels both weirdly out-of-place in cynical 2018 America, and completely earned. Neville paints Rogers as an American hero, one who built that heroism on something as simple as decency, and believing in the fundamental value of a child's feelings. At the same time, the Neighborhood clips that Neville includes provide a reminder that Rogers' show itself was often incredibly complex in its respect for the psychology of children. It borders on heartbreaking as we watch Daniel Tiger sing a song about wondering whether he's a mistake, a self-talk that doesn't disappear entirely even when someone reassures him of his worth. In archival footage of Rogers' personal recollections of conversations with children, as well as filmed interactions between Rogers and live audiences of children, we see the genuine love that he inspired because on a young child's primal level, they knew that this man listened to them and cared about them. This is why you might spend the majority of Won't You Be My Neighbor? on the verge of tears, and not just because we get obviously heartstring-tugging moments like an episode in which Rogers had a wheelchair-bound young boy named Jeff Erlanger as a guest. As perhaps obvious-in-hindsight as it might be to note that conservative commentators attempted to turn Rogers' "you are special" message into a cause for the wimpification of America's children, it's always clear from Neville's documentary how this ordained Presbyterian minister interpreted his Christian faith as a call to exalt individual dignity. Maybe Rogers wasn't ready in the late 1960s to allow a member of his cast like the openly gay Clemmons to be seen in a gay bar, but he was an example of the idea that, as one interview subject here puts it, there was "another way of being a man." The kindly gentleman who told us in times of difficulty to "look for the helpers" would never have had the ego to acknowledge that he was talking about himself.